During the Great Depression, from 1923 to 1930, we had some of the worst and some of the best times of our lives. My parents came from Poland in 1910 and settled in a small town in Western New York State called Olean. Father found work on the Pennsylvania Railroad. He never had a car, and he walked five miles to work and five miles back each day. There were 10 of us children. Polish was spoken at home, but when we started school, we soon picked up the English language. In fact, my favorite subjects in school were English and spelling. I recall my father spending many evenings mending our shoes. He purchased shoemaker’s lasts in different sizes. The shoe to be mended was laid on the last and the worn sole pulled off. Then, tracing the bottom of the shoe on a new piece of leather, he cut out the right size. After that, the sole was tacked onto the bottom of the shoe with special nails and properly nailed on, so that the nails would not go through the top part of the shoe. With that done, he then trimmed the excess leather and instructed us to stain the edges of the new leather to match the rest of the shoe. He usually had a row of shoes to mend. The repaired shoes were rather thick and clumsy at first, but we quickly broke them in and the shoes were serviceable for a long time. It met our needs. On another occasion, a farmer friend stopped in front of our house to visit with my father, who was outside. 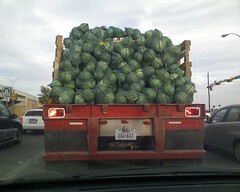 He had a load of cabbages in his truck to deliver for sale up town in Olean. During the conversation, he mentioned that he would sell them for a penny a head. My father perked up his ears and asked how many he had. His reply was, “I have 100 heads.” My father did some quick thinking, and the cabbages were carried into our cellar – all 100 heads — at a penny apiece. We never ran out of the sauerkraut in the barrel in our storage shed that year! We had a variety of ways to use sauerkraut, with kielbasa, pork chops and corned beef sandwiches. To this day, I am very fond of cabbage. Life today is certainly very different, but cabbage is still a staple. This entry was posted in Angie's Smorgasbord and tagged Cabbage, Corned beef, English, Great Depression, kielbasa, leather, Olean, Pennsylvania Railroad, Poland, sauerkraut, Shoe.